All right I give in. After I had posted about the bergedil recipe and had a couple of friends raving about Soto Ayam (apparently Bergedil should be eaten with Soto Ayam) I kept thinking about it and finally decided to make it! So my deep dark confession is that I am not that fond of Malay food except for Nasi Lemak or Nasi Goreng. So if given a choice, I wouldn’t eat Mee Siam, Mee Goreng or Mee Rebus. I can’t really explain why except perhaps that some of the noodle dishes have a sweet overtone which probably doesn’t quite suit my palate. BTW I am not fond of the Thai salty sweet combination too, and I hardly step into Thai restaurants. So it surprised me to hear of friends who would dream at night of Soto Ayam. And the thought kept running round my head the whole of last night and so I decided to give this recipe a go this morning. 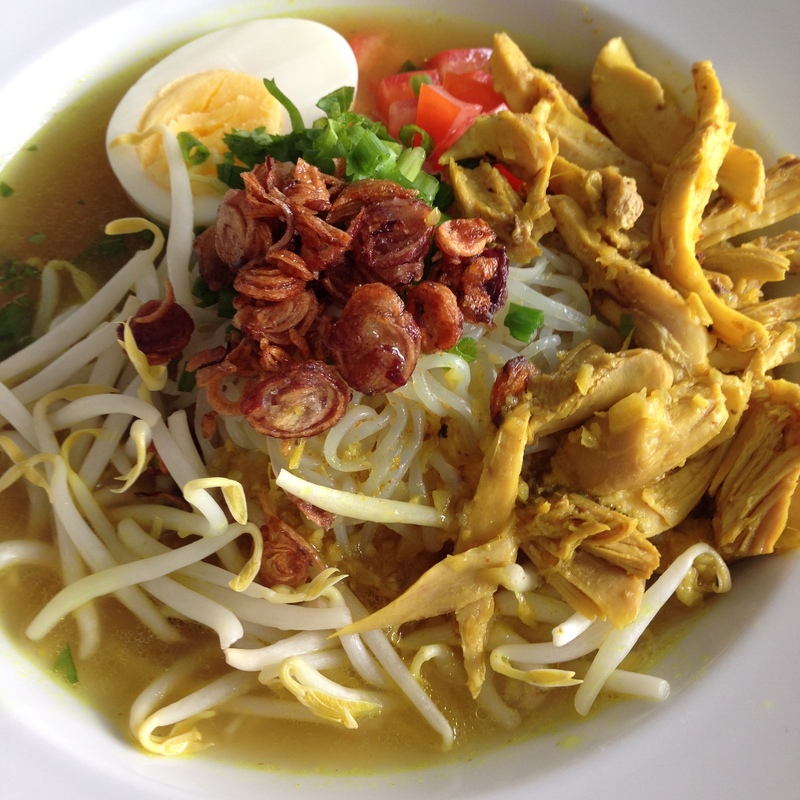 Soto Ayam is actually an Indonesian chicken soup dish that is redolent of herbs and spices. Because this turmeric and gingery broth is so rich it probably is more like a stew than a soup. The soup itself can be served with yellow noodles, rice noodles, rice or rice cakes (ketupat). For a low carber like me I just do a simple substitute with Shirataki noodles. This dish was surprisingly easy to make, and most of the ingredients are really easy to pull together such that I could have this for breakfast by 9 am after starting the cooking process by 6 am (it would have been faster if I didn’t have to run to the market for towgay…). Verdict? Surprisingly pleasant and rich and I kind of get why my friends love this noodle soup. I think it actually has hopped into my list of must-have comfort food recipes. The recipe was easy and I would do it again for a quick Sunday lunch. 1. Place chicken in a soup pot with lemon grass, salt and 2 L water. Bring to a boil over high heat. Skim off any foam and reduce heat to a simmer. Cover and simmer until chicken is tender, about 45 minutes, skimming as needed to make a clear broth. Remove chicken pieces from broth and set aside. Remove and discard lemon grass; reserve stock in pot. Pick the chicken meat and shred it, discarding the skin and bones. 2. Meanwhile, pulse the ginger in a food processor, followed by garlic and shallots until finely minced. Combine with ground black pepper, ground tumeric powder, coriander seed powder and ground cumin and continue to pulse and mix into a thick paste. 3. Heat vegetable oil in a medium saucepan over high heat. When very hot, add spice paste and cook, stirring until paste is slightly browner and fragrant, about 5 minutes. 4. Add cooked spice paste and chicken meat to stock. Bring to a simmer and cook 10 minutes. 5. Prepare Shirataki noodles. If not doing a low carb version, you can use yellow noodles and blanch lightly before serving. 7. To serve, divide noodles in large soup bowls. Ladle chicken pieces, half a hard boiled egg, chopped tomato, bean sprouts and soup on top and sprinkle with celery leaves or herbs, and fried shallots, if using. Serve with lime and sambal chilli on the side.